Soon after arriving in Charlotte I dined at Libretto's Pizzeria & Italian Kitchen for lunch with a family friend who works in a similar field. There are two area Libretto's: this one is in Ballantyne and the second one is uptown at the EpiCentre. Additionally, there is a NYC location and a fourth location in Jacksonville, Florida. Libretto's serves a full Italian menu with specialty pizzas, salads, soups, traditional entrees and pastas as well as heros, wings, calzones and desserts. 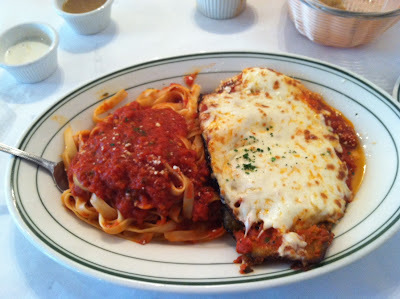 For lunch there are some great specials including the eggplant parm special that I tried. 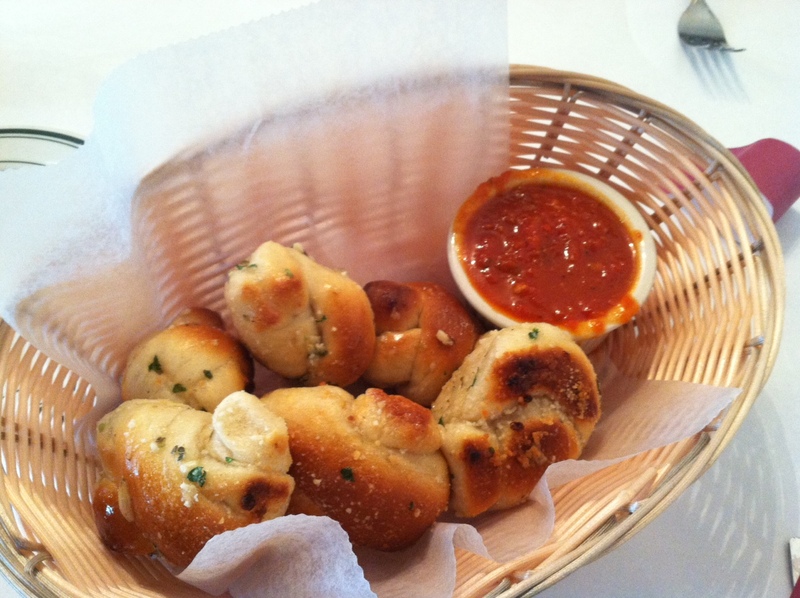 To start, we shared some of the delicious, buttery, garlic knots served with tomato sauce for dipping. These are truly worth the carbs and were great with the salad that comes with the lunch special (salad not pictured). The eggplant parmesan includes choice of pasta with sauce and it's a huge portion! I took half home for later. The dish itself was quite pleasing, with a well-balanced tomato sauce, lots of cheese and plenty of eggplant goodness. The pasta was also tasty with that same great tomato sauce. I had one odd thing happen when I went to the restroom - I won't go into great detail but let's just say that the restroom needed some real attention! I mention this mainly because as soon as I told our waiter about the problem we noticed that the staff shut down the restroom for cleaning - a good sign that they actually checked out the issue when I brought it to their attention. Service was actually quite good overall, which is always welcome. I really enjoyed my visit to Libretto's and I look forward to trying them out again soon for another lunch or for dinner. They are also prepared for folks who want takeout also as you can order pizza near the door and take it to-go. I will be back!